Japanese books and magazines have their spines on the right side, which makes Westerners feel they are reading from back to cover. The Japanese read newspapers and books from top to bottom and right to left. Books read right to left with the script hanging vertically from the page. Most novels are printed with the texts in vertical columns. Exceptions are books and periodicals devoted to special subjects scientific and technical matter, which are printed in horizontal lines and read from left to right. Nowadays there is a tendency to print books in horizontal lines. These publications open in the same way as their Western counterparts. People need to know three alphabets to read a newspaper in Japan. The difficult-to-master Japanese writing system consists of two phonetic alphabets---the 48-letter hiragana (for Japanese words) and the 48-letter Katakana (mostly for foreign words)---and Chinese characters known as kanji. Japanese school children memorize 80 Chinese characters by the end of the second grade and master around 2,000 characters (the number found in an average newspaper) when they graduate from high school. Most educated Chinese can read about 5,000 characters. Chinese, Koreans and Japanese use the same Chinese characters. The meanings of the characters is usually the same but the pronunciation is different. The character for soy sauce, for example, is pronounced "shoyu" in Japanese and "jiangyou" in Mandarin Chinese. After World War II, the Japanese simplified their characters (made them easier to write) and changed their appearance. The Chinese did the same thing but used a different system, while the Koreans stuck to the old character system. Now the characters in all three languages are the same but they look different and are pronounced differently, if that makes any sense. Foreign students who study Japanese struggle with the written language, especially the kanji. Kanji is particularly difficult to master because most characters have multiple meanings and the meaning used often depend on whether the characters are used singly or in groups. The Chinese system of writing was introduced to Japan in A.D. 405. 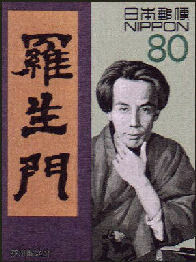 Later modifications were made because Chinese characters don't adequately reflect the pronunciations of Japanese speech. Japan developed strong phonetic components in its written language by the 9th century. Hiragana began its development in Japan during the Heian period (794-1192) and was originally based on characters from China. At the time, the syllabary was used mainly by women. Calligrapher Mariko Kinoshita said: "I love the simplicity and suppleness of hiragana. Is it not amazing that we still use these letters that our ancestors made?" During the Heian period (794-1185), Japanese script was developed. Chinese characters were often unsuited for certain Japanese sounds and priests developed two sets of writing based on Chinese forms. By the middle of the Heian period these forms were unified and simplified into a writing form called kana. As the use of kana become widespread, it paved the way for the development of a unique Japanese literary styles. Knowledge of kanji has always been a sign education, breeding and accomplishment. Primary school students learn about 1,00 kanji by the ed of 6th grade, Middle school students learn not write sentences with the 1,000 and learn to read another 939. In November 2010, the Japanese government announced its first kanji reform since 1981. The new list of 2,136 characters approved for everyday use, up from 1,945, including 196 Chinese characters not on the 1981 list and five deletions. The new list contains many difficult-to-write kanjis which are easier to make with computers and cell phones than by hand and are now used more. The reform in 1981 added 95 characters. Now that so many Japanese write kanji with hiragana on computers they have forgotten how to make kanji characters by hand. Less than 20 percent of the people have taken a national exam, that requires knowledge of 2,000 kanji characters, have passed it. And, many young businessmen can not write kanji very well and use hiragana on memos, which is considered shameful. Many Japanese have difficulty simply writing by hand. "The only time I write by hand is when I write envelopes and when I have to fill out forms," a linguistics professor told the New York Times. "When it occurs to me that we need spinach and soy sauce, I write an electronic message to my wife, even if she's in the next room." One calligraphy instructor told the New York Times, "At school, teachers themselves can't write well anymore. So they can't teach how to write properly any more." Some misplaced dots, squiggles or lines can transform the meaning of kanji characters: A forgotten line makes "Your enlightened worship" (a common written farewell) into "You enlightened piece of trash;" other mistakes change "hall of ambassador" (the literal translation of embassy) into "hall of feces," and his "His Majesty the Emperor" into "Emperor under the staircase." Until the 1980s, when the word processor was introduced, most Japanese was written long-hand. Japanese typewriters tended to be complicated an unwieldy. Typing Japanese can be quite tedious. Words with hiragana and Katakana are typed liked English words on a Western keyboard. Chinese characters, however, are made by phonetically spelling the Chinese character in hiragana and then pushing a button which changes it into the desired Chinese character. Cell phones have not only revolutionized the way Japanese communicate verbally and through messages they have also revolutionized the way Japanese write. 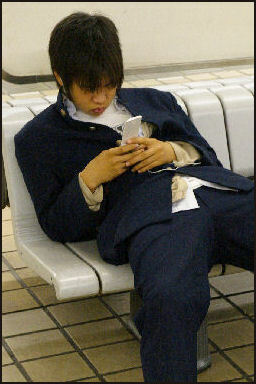 On a Japanese cell phone you type in hiragana and katakana. For kanji, rather than laboriously making the multiple-stroke characters, you type in syllables of hiragana and katakana, and the phone provides a list to choose from of kanji the user uses most frequently. This phenomena has led to a general dumbing down of the written language. Kanji are now used less frequently and those that are used are simple and common and are ones most everyone is familiar. This partly explains why cell phones novels are so popular in Japan: they are easy to read and easy to write. With a cell phone you can read them any time and any place.